My mom recently gave me a book called Cuisine moderne et vieilles recettes. She bought it in Belgium, when she was an au pair there. I’m having such a nice time reading it! I don’t speak French at all, really, but I studied it in high school and college, so I recognize some words, and then I’ll use google translate to try and understand the rest. (“Put a bead on the mold of lacking, in the basement, before boiling the under wall?! ?” Okay, I’m on it!! Sounds delicious!) My mom wrote some notes, in french, on some of the recipes. It just kills me! It’s the same handwriting she has today. I’d like to be there making the recipe with her! I admire my mom so much. She’s so brave and thoughtful and full of energy. She went from Kansas to Belgium, and she’s been more places since than I will ever visit in my life. And she travels with curiosity and empathy. She seems fearless, sometimes (but I know she’s scared of loud bangs and high heights) . I’ve had to skip over some passages (and pictures) in the book, that talk about rabbits and livers and tongues (it’s a lot like reading Mrs. Beaton, actually!). 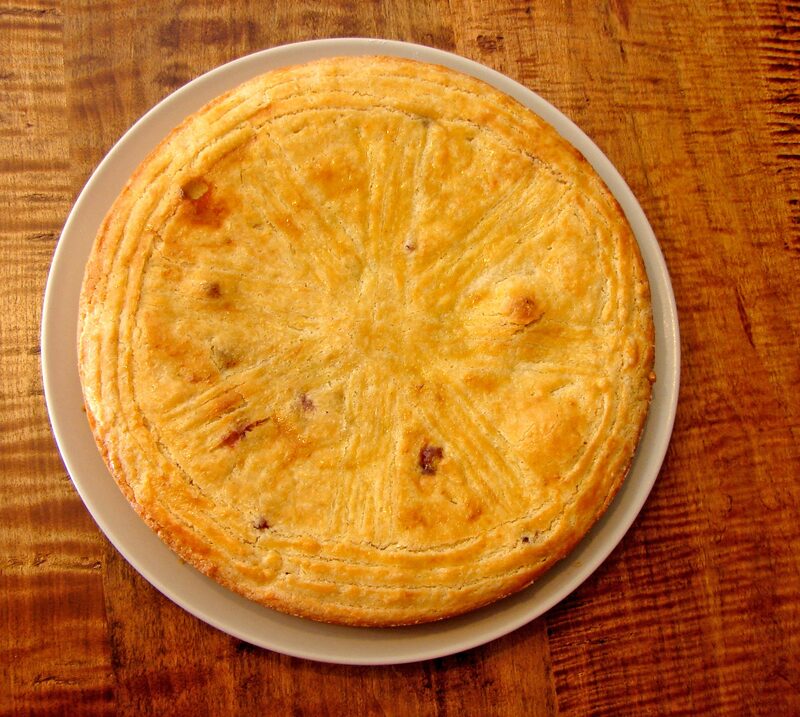 But I was very taken by a picture of Gateau Basque. I’ve been fascinated by the idea of anything Basque since I read Bridle the Wind, by Joan Aiken. (The best children’s book author ever!) One character, a Basque girl, was fiercely, stubbornly independent, and so appealing. I love the idea of a region between Spain and France (both plenty fascinating on their own!) with its own language, its own music, its own history, and its own food. So I had to make this gateau basque – at least my poorly interpreted version of the recipe! It turned out dangerously delicious! It’s like a giant butter cookie or jam tart! It’s rich and dense and sweet. 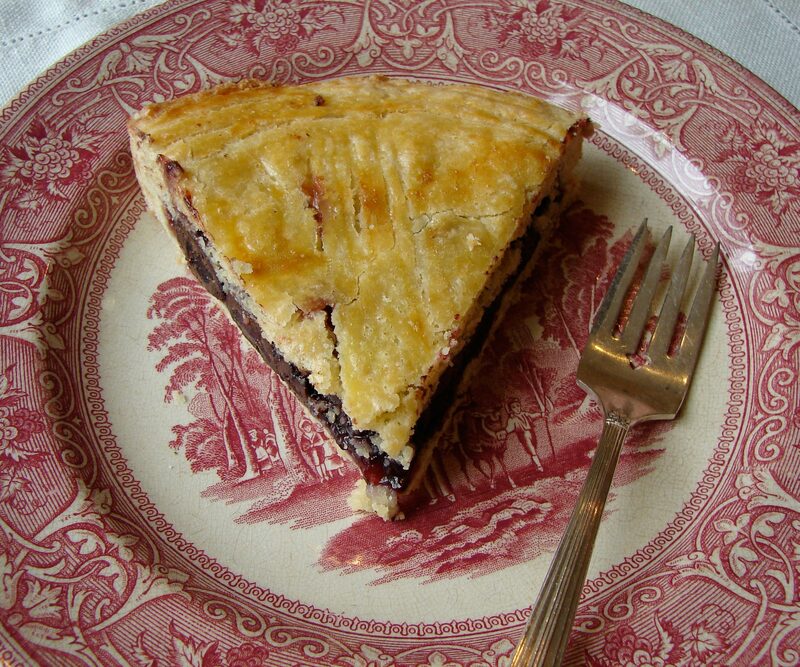 You had the choice, in the recipe, of filling it with pastry cream, but, it said, “…ou mieux, avec de la confiture de cerises (ce gateau se prépare géneralement avec de la confiture…)” So I was going for the jam, because that was better. I decided on a very Claire-y combination of quince jelly, blackcurrant jam and … Chocolate covered cherries. I was worried the whole thing would be too sweet, but Malcolm rejected his piece because it tasted bitter to him. And David said he’d like this cake for his birthday! Done and done, my love!! I’ve just been doing some reading about Basque music. This is amazing! Martxea Albokeagaz, by Maurizia, Leon eta Basilio & Fasio. Smokes! It sounds gaelic, arabic… wild and beautiful!! I’ll be learning more about this!